Colors: Slate Blue, Blue, Pale Blue(Slight Blue), Green, Grey, Silver, White, Black, Violet Purple, Red, Rose Red, Pink, Luxury Gold, Cyan. The 0.8cm silicone tip is very sensitive and durable, suitable for all of the touch screen devices, when you are writing, protect your screen from the fingernail scratched and getting dirty. The 0.5cm ballpoint tip writes fluently & uninterruptedly,its ink is uninterrupted. Streamlined penholder, compact and lightweight, convenient to carry. Aluminium alloy metal material, steady & feels very good, plus transparent glass tube filled with crystal, looks very fashionable and beautiful, noble & generous. Too cold in winter, if you don't want that your hand freezed your hand when use a mobile phone, use our skoloo touch pen, please. 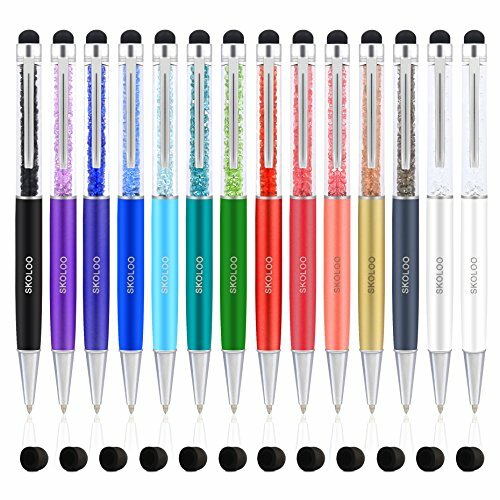 Summer is too hot, a lot of sweat, very wet & very dirty, use our use our skoloo touch pen, please. It can be either by tapping the screen, and can write your feelings, no matter in life, office, travel, will bring you a lot of convenience. 2-in-1 Touch Screen Stylus + Ballpoint Pen --Works as a normal ball-point pen; High sensitive to type or tap as so to work quickly and accurately. If you have any questions about this product by Skoloo, contact us by completing and submitting the form below. If you are looking for a specif part number, please include it with your message.